There are a lot of fancy desserts that take a lot of time to make. You have to be precise. You have to be careful. You need to take your time. Well guess what? I don't have the time right now! I want decadence now. I don't want to have to chill it overnight, let flavors merry or bake for an hour. Well, sometimes I do, but I didn't this time. You guys know Alex. He's my close (boy)friend. He is hungry. Almost always. And, well, what Alex wants, Alex (sometimes) gets. He finds me recipes all the time because he is really great like that. 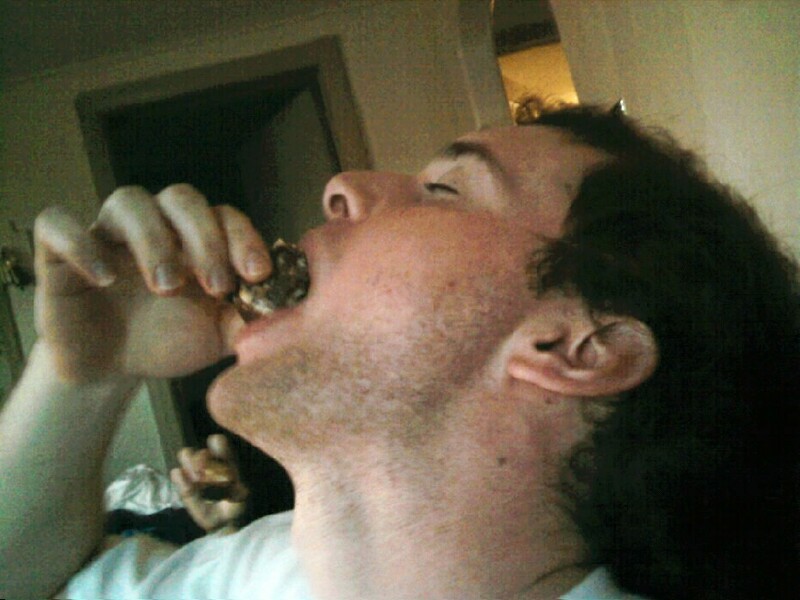 A few weeks ago, he got really excited about a recipe he found through Stumble Upon. He does, he really does. And though sometimes he doesn't love fruit, when you stuff it with something delicious, even the most finicky eaters will succomb! So I whipped them up. You can do it the easy way or the hard way. 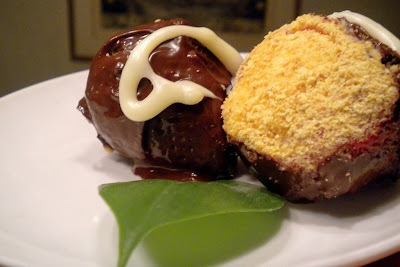 This time, I opted for easy, but I think if I make them again, I will try it with a more homemade twist. 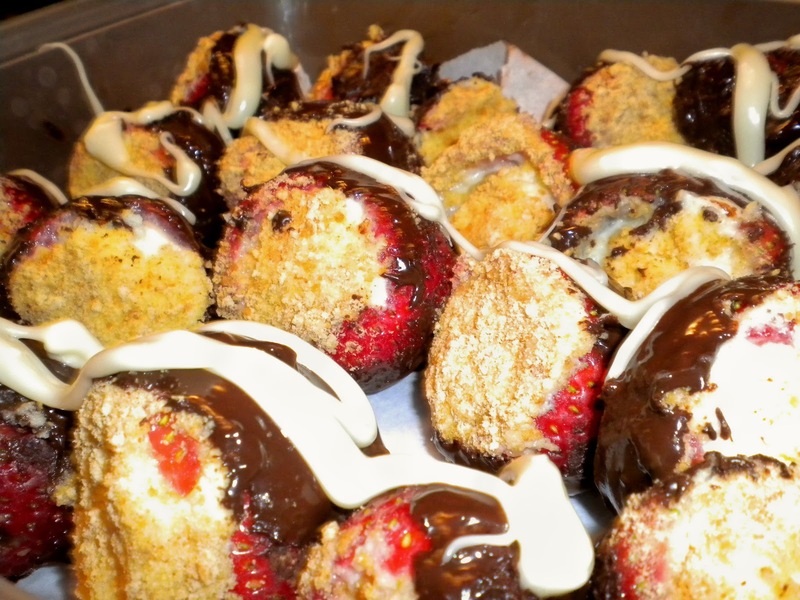 Anyway, read on for my newest addition to the recipe collection, Cheesecake Stuffed Strawberries. Oh, and I apologize if the pictures aren't all that exciting. I had to take them late at night with no natural light. You know how much of a drag that is. Guess what? The boy loved them. So did his roommates and some friends they had over on Friday night. 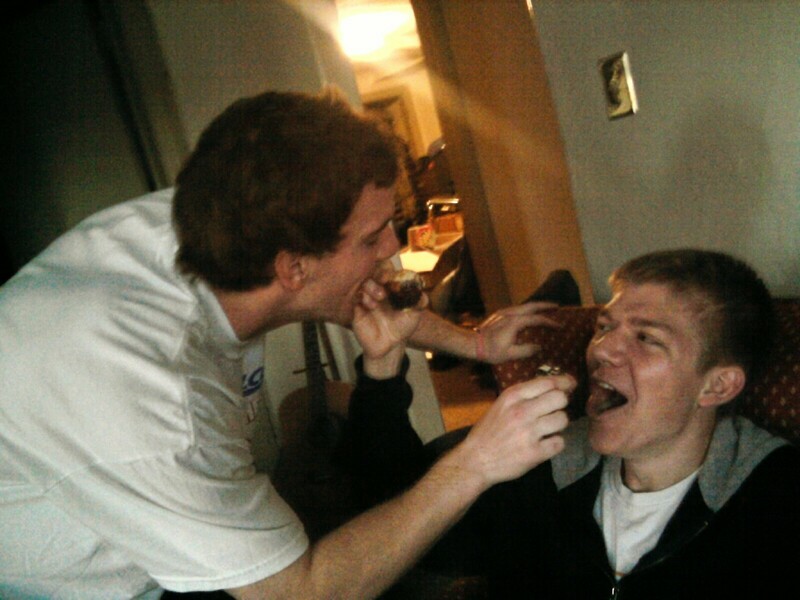 He shared! How sweet. Anyway, my one piece of advice is eat these in two days or so... by the third day, the strawberries get a little tired of being stuffed, and they start to get a little mush-mush. But it shouldn't be a problem... you will want to gobble them up! 1. Wash the berries and hollow out the centers with a small paring knife. 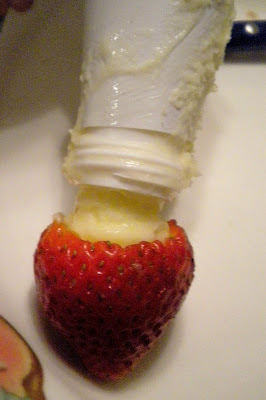 Leave enough so each strawberry can hold it’s shape. 2. Mix the cheesecake according to the directions, but you do not have to chill it before you use it. 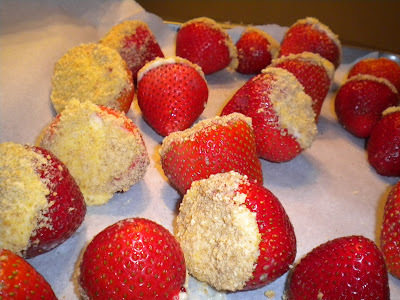 Put the cheesecake in a piping bag and fill each strawberry until slightly overfilled. 3. 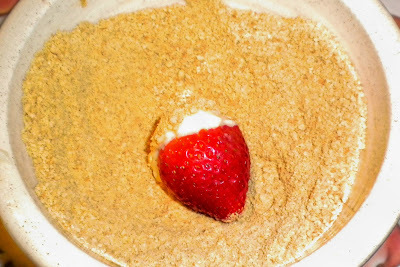 Pour graham cracker crumbs into a bowl and coat the top of each strawberry with grahams. 4. Melt the chocolate in the microwave stirring after every 30 seconds until no lumps remain. 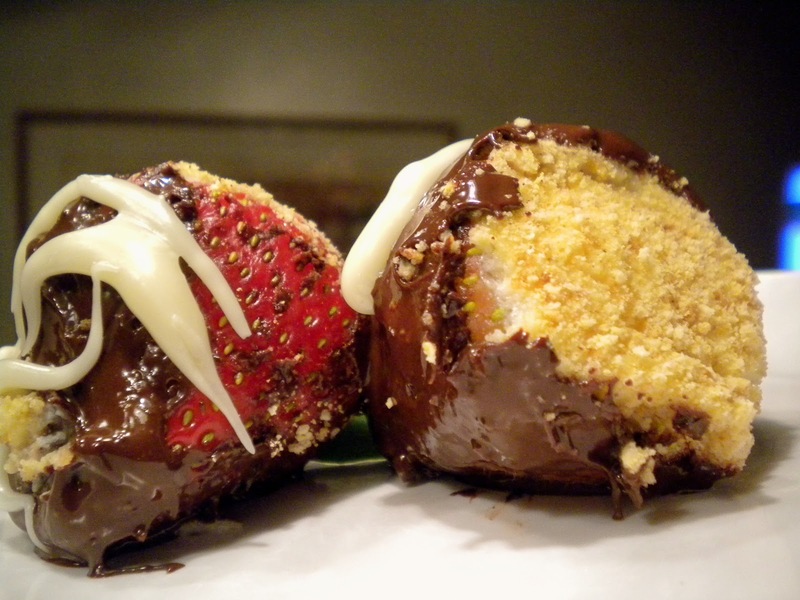 Dip each strawberry in the chocolate and put on wax paper to cool. 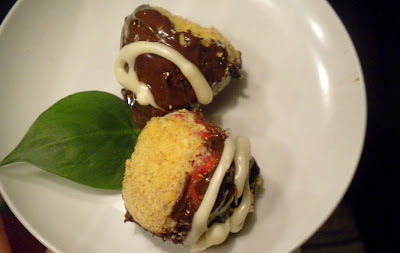 5.Top with a drizzle of white chocolate and serve! 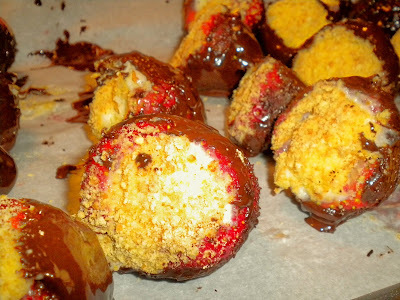 Store these babies in the fridge, and enjoy!! The flavors alone strawberries and cheesecake tell me they are good. I hate where there isn't enough light for photos. They still sound divine, gonna have to try these! I ate one and learned how to dougie. 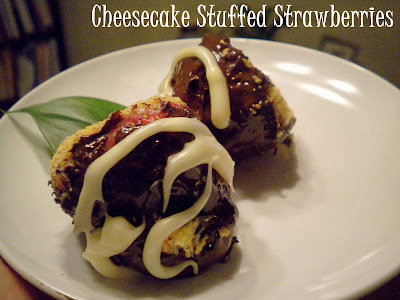 You must be a "saint" to have the patience for these little strawberries filled with the yummy cheesecake fillings. They look amazingly divine. I get the same problem taking a photo at night...get the same pinkish light in the photo ie. my last post. I am following your blog, don't want to miss out on any great stuff...hope you'll follow mine too! You had me sold when I saw this on my blog reader...and then I click on the post and I'm treated with all of these delightfully tempting photographs! Can I please have one right now? I'm sure the boys loved them (and you). These are spectacular! I love this idea. I can't wait to try this. It is a great alternative to cheesecake. That's a fun twist. Switching the ideas up a little bit. Normally it's a cheesecake with strawberries. It looks good. Awesome! I love the idea of those recipes. It is so unique and amazing. Better try this one for our high school friends reunion. Thanks a lot. YUM! I love the idea. You are so artistic in creating a new recipe. I should better try this one when my friends come here in house.